Children's play parks helped drive growth in the number of people going to visitor attractions in Scotland last year, annual figures show. Across the country, tourist sites outperformed the rest of the UK with a higher increase in visitor numbers for the seventh year in a row. Newhailes House near Musselburgh and the Robert Burns Birthplace Museum near Ayr saw some of the fastest growth. 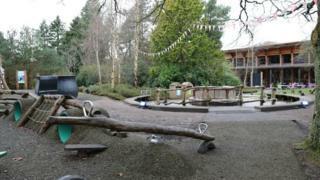 Both have recently launched new children's playgrounds. More than 266,000 people visited the Burns museum in Alloway - an increase of 62% on the previous year. It is home to the Wa-Hey For Play park. While Newhailes House - and its Weehailes park - welcomed 68,360 visitors (up 1168.7%), according to the Association of Leading Visitor Attractions (Alva). The increase north of the border (19.07%) was once again higher than the UK average (8.68%). The National Museum of Scotland was the most visited attraction outside London, while Edinburgh Castle was Scotland's most visited paid venue. Alva counted 2,227,773 visits for the museum followed by 2,111,578 for the castle. The group said Doune Castle near Stirling gained from its role in the Outlander TV series. The Highland Wildlife Park in Badenoch saw a boost in visitors after the birth polar bear cub Hamish. And a focus on Charles Rennie Mackintosh, 150 years after his birth, saw a 20% lift in the numbers visiting the school he designed in Glasgow's Scotland Street. Elsewhere, the new V&A Dundee recorded 341,265 visits by the end of 2018. Alva said weather conditions, including the Beast from the East cold snap, played a part in some visitor numbers dropping off. However, the warm summer spell sparked a 2.5% increase in visitors (929,140) to the Royal Botanic Garden in Edinburgh during 2018. Alva director Bernard Donoghue said 2019 "should be another exciting year". He added: "Attractions across the UK have shown that investing in their buildings, gardens and staff, presenting globally significant exhibitions and working together to bring iconic artefacts to more people, has been hugely successful." The Scottish government's tourism secretary Fiona Hyslop, said: "Our galleries, castles and museums showcase Scotland's incredible culture, heritage and history. "We will continue to work to support sustainable growth of the industry as it creates jobs, boosts the local and national economy and builds on our strong international reputation."